I wonder how much his dislocated thumb (suffered at the beginning of June) has to do with this? 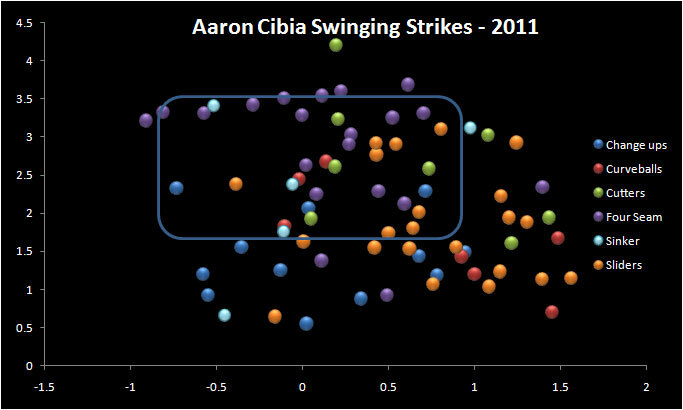 Maybe nothing as it relates to the swing, but I can definitely see it sapping his power when he does make contact. Hey, I've got an idea, save yourself some time tomorrow, just change JP Arencibia to Rajai Davis, take out the 'still young' thing, and your next post has written itself! I started scrolling down on this post and when I got to the word 'Swinging strikes' only the top half of the graph was visible. I said to myself "Is Drew going to say that he's struggling with the ball up and away?" and then I scrolled down to the bottom half of the graph and said out loud: 'Oh dear.' in such a tone that my roommate asked me from the living room if something had gone wrong. I'm not sure why the whiff rate against sliders would increase if you were seeing more, unless you were in a funk. And if you were in a funk, maybe you'd then see more sliders. So maybe cause and effect are reversed here. Or maybe not. In any event, I wouldn't make any pronoucements on JPA until at least 2021. But then I'm risk averse. I'm working on something for later this week..I think he's in a funk. Not all his doing, to be fair. The Dwayne Murphy Effect.. got lucky with bautista, but everyone else has suffered from his pull-heavy approach. Most hitters can't pull balls on the outer third of the plate like jedi can, but everyone on this team other than YEScobar is trying to. Davis is a career .290ish slap hitter with a lot of speed that got a few hrs in ST and thought he was going to 'break out' at age 30 instead of sticking with what has worked throughout his career. Aaron Hill used to have oppofield gap power, now he's just another 250 hitter that may pull 20hrs against bad pitchers.